(17/P40) TRENTON – The Department of Environmental Protection and U.S. Army Corps of Engineers (USACE) today announced that work on a project to build beaches and dunes on Atlantic County’s Absecon Island will begin next week with work in Atlantic City, followed soon thereafter by construction in Ventnor, Margate and Longport. Encompassing eight miles of shoreline, the Absecon Island Coastal Storm Reduction project is a joint effort of the USACE’s Philadelphia District and the DEP. The $63 million project calls for periodic replenishment of beaches and dunes for Atlantic City and Ventnor that were already designed to meet USACE engineering standards. It also calls for construction of beaches and dunes for Margate and Longport that meet USACE standards. Following launch of the Atlantic City portion of the Absecon Island project, work will proceed from north to south to maximize efficiencies in the deployment of dredge equipment. Work in Ventnor is tentatively scheduled to start in early June, followed by Margate in mid-July and Longport around the third week of September. To minimize impacts to tourists and residents, work will progress in 1,000-foot segments. Only those sections of beach where work is occurring will be closed. The Absecon project calls for a 200-foot-wide beach, also known as a berm, and a dune built to an elevation of nearly 15 feet above sea level for Atlantic City. A 100-foot-wide berm and a dune to an elevation of nearly 13 feet above sea level will be built for Ventnor, Margate and Longport. More than 3.8 million cubic yards of sand will be dredged from approved offshore areas and pumped through a series of pipes onto the beaches of the four municipalities. The sand will then be built into a dune and beach system designed to reduce potential damages to infrastructure, businesses, and homes that can occur from coastal storm events. In addition, the contract includes the construction of public access dune crossovers, placement of sand fencing, dune grass plantings, and the repair or extension of existing storm water outfalls and drainage structures. The Army Corps contract is being implemented by Cranford-based Weeks Marine Inc., which will also be working on the northern Ocean County project. The Absecon Island project was only partially completed when Superstorm Sandy slammed the state in October 2012. The project in place helped to dramatically reduce damages along those sections of the island. The USACE had completed the initial construction of the project at Atlantic City and most of Ventnor in 2004. These sections of the project received sand nourishment in the spring of 2012, months before Sandy. The areas were restored in 2013, just months after Sandy. 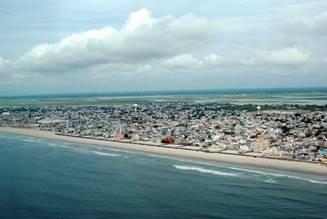 Completing the initial construction in Margate and Longport is funded entirely by the federal government through the 2013 Disaster Relief Appropriations Act, commonly known as the Hurricane Sandy Relief Bill. The periodic nourishment of the Atlantic City and Ventnor portion of the contract is cost-shared, with the federal government paying 65 percent of the project and the DEP paying 35 percent. Following the completion of initial construction, the project is eligible for periodic nourishment.